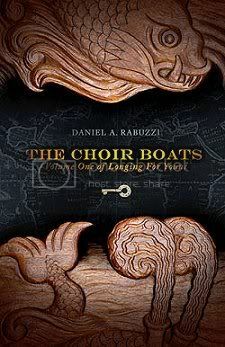 News: The Choir Boats by Daniel Rabuzzi Available as Free Download! I received some news today from author Daniel Rabuzzi saying his debut fantasy novel The Choir Boats is available as a free ebook in July! My debut fantasy novel The Choir Boats (ChiZine Publications, Toronto, 2009) is featured as Wowio's July Book of the Month. During July 2010 only, the e-book version is FREE here. Reviewers describe it as “Gulliver’s Travels crossed with The Golden Compass and a dollop of Pride and Prejudice,” and "a muscular, Napoleonic-era fantasy that, like Philip Pullman's Dark Materials series, will appeal to both adult and young adult readers." The Choir Boats was selected by January Magazine as a Top Ten YA Novel for 2009. This special edition of the novel includes bonus illustrations by Deborah A. Mills. It's also DRM-free, so it can be read on any device compatible with PDFs, and shared with friends just like a regular book. Find out more about The Choir Boats on Daniel Rabuzzi's website. I downloaded this yesterday, and I'm looking forward to reading it. Looks so good!